On the sandy banks of the Thompson River, people slowly weave their hands together in a salmon dance. They’ve come together from across the Secwepemc Nation to rally against the proposed expansion of the Trans Mountain pipeline that runs underneath the Kamloops river. Though they’re more than 300 kilometres east of Burnaby, B.C. – the hub of protests against the $7.4-billion project – people here say they’re worried about its potential environmental impacts on the salmon population. 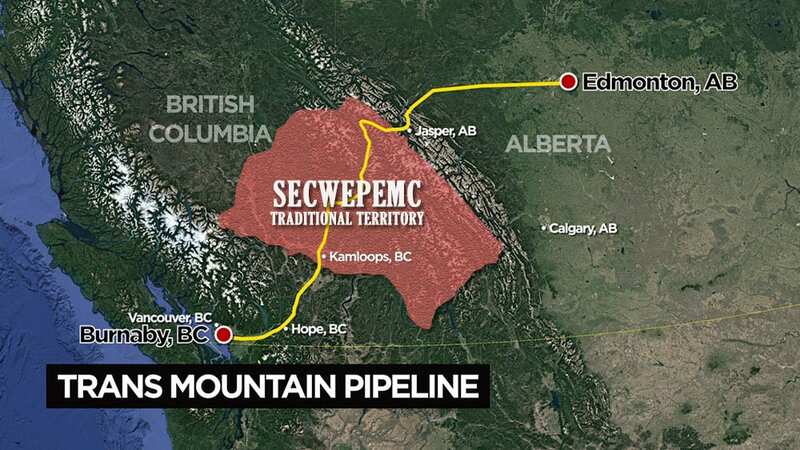 The existing pipeline runs through 518 kilometres of Secwepemc territory – almost half of the 1,150-kilometre route from Edmonton, Alta. to Burnaby, B.C. 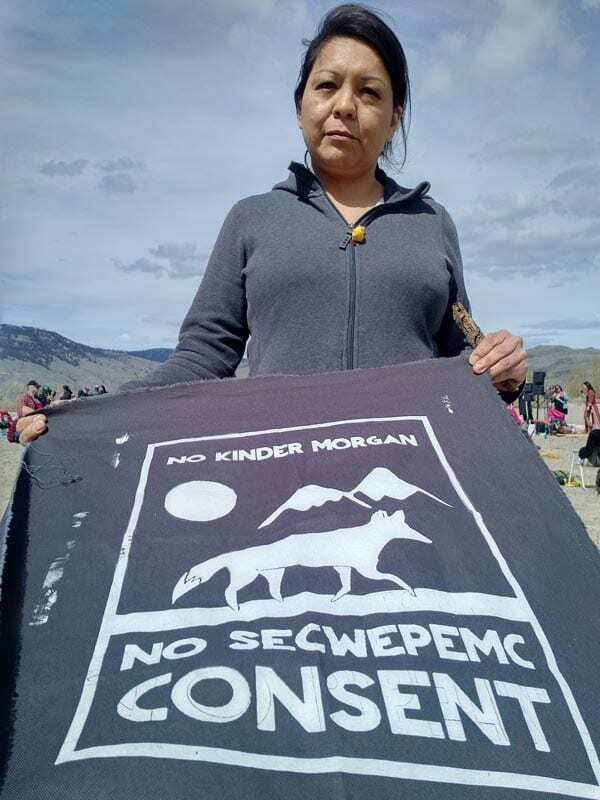 In Secwepemc alone, just four of the territory’s 17 bands have signed mutual benefit agreements with Kinder Morgan on the pipeline route: Whispering Pines Indian Band, Tk’emlupsemc, Simpcw First Nation and Canim Lake Band. 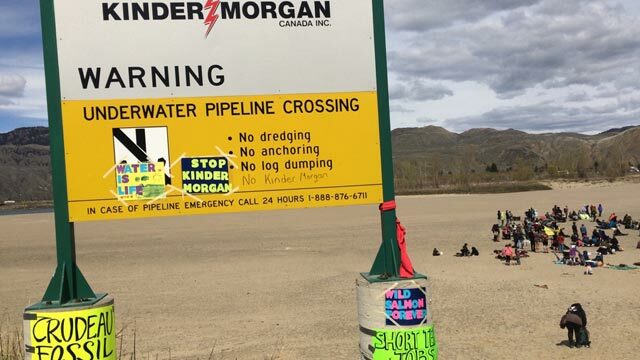 Anti-pipeline advocates in the territory say Kinder Morgan does not have their full consent. “We’re not going to do anything and collaborate with any type of corporations or governments that are about destroying our territory and risking our livelihood because we still depend on our food harvesting practices,” says Kanahus Manuel, who’s spearheading a project to build tiny houses in Secwepemc territory in an effort to block the project. 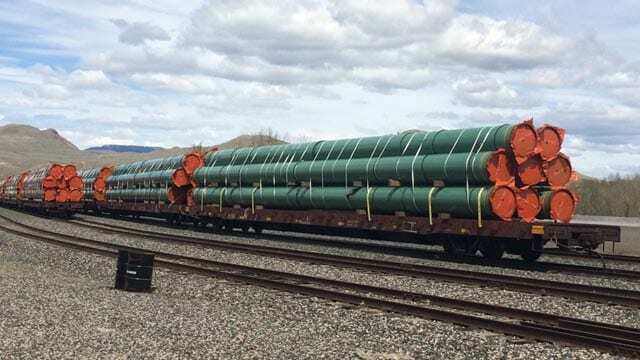 The expansion project is currently in limbo, as the federal government and the province of Alberta scramble to save the pipeline ahead of Kinder Morgan’s May 31 deadline to pull out. Just down the river from the Kamloops rally, railcars carrying pipes for the expansion sit idle, as the company has halted all “non-essential” spending on the project in the meantime. Across the pipeline, the company has signed 43 mutual benefit agreements with Indigenous communities, amounting to more than $400 million. 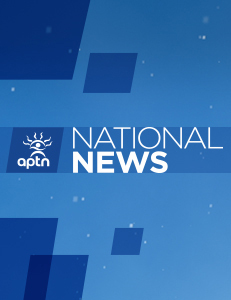 Some First Nation chiefs say they would rather be at the table than miss out on this opportunity. That’s the case for Whispering Pines Indian Band Chief Mike LeBourdais, whose community stands to earn between $10 million and $20 million if the pipeline is built. For LeBourdais, the deal is not just about providing those basic necessities for the reserve’s 200 members. And it’s not just about providing university funds for every student or helping the community’s elders retire in comfort. It’s about jurisdiction over the band’s territory. He said the deal – and he credits Kinder Morgan for being “very transparent” throughout the negotiations – gives the community environmental oversight, including the ability to hire its own engineers to work on the pipeline. “The pipe could send apple juice. I really wouldn’t care. I want the environmental oversight and I want the tax authority. That’s what I want,” he says. “For me, it’s a jurisdiction issue. Simpcw First Nation Chief Nathan Matthew recently reiterated his support for the pipeline, calling out B.C. Premier John Horgan, who’s against the pipeline, for only listening to those who side with his views. “After seeing what’s out there in the media, council decided that it’s important we speak out,” he said in a press release.